Pray to the storm gods. Fortnite’s Week 9 challenges task players with visiting three different taco shops in a single match. This challenge is pretty simple on the surface, but you’ll still want to know where the taco shops are – plus some tips for how to survive long enough to visit them all. Luckily, we’ve got you covered with a map, route suggestions and more. The fact this challenge must be done in a single match makes it rather difficult. 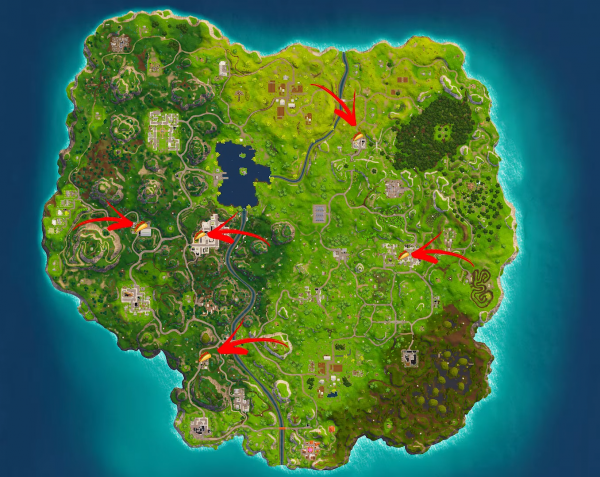 Not only will you have to head between three different built-up areas while not getting murdered by another player, you will also have to cross your fingers and hope the storm is on your side. With that in mind, we’ve put together the safest route for you to complete this difficult task. As you can see from the map above, there’s one taco shop at Tilted Towers. It goes without saying that it’s probably best to not head there first if you don’t want to die. We suggest starting in the taco shop in the location south of Shifty Shafts. From there, go to the football pitch west of Tilted Towers, then head to Tilted Towers last – handily, the Tilted Towers taco shop is on the west side as well, so you should come in from the right angle. One the more difficult challenges this week is to follow the treasure map found in Moisty Mire – but we’ve got you covered with instructions on how to find the star. Do you think Titled Towers might be destroyed by a comet? That’s a mad theory floating around amongst fans right now. Fortnite Season 4 begins in just a few days and it looks like the theme is superheroes. Get your masks and spandex ready.